There will be an outbreak of above virus worldwide very soon. We would like to create awareness to prevent this virus outbreak. Below are details of virus details, guideline and action item you have to do as pre-emptive measure to counter the virus outbreak. A worm known as W32.downadup.B has been detected in Malaysia. The worm exploiting the vulnerability in the Windows Server service (svchost.exe). 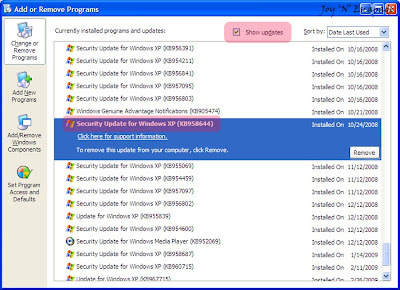 Microsoft has developed security patch (KB958644) to fix the vulnerability. And now it call Called W32.Downadup.C, this variant presented substantial code changes to the malware. This virus will attack those Windows 2000, XP, Vista as well as Windows Server 2003 and 2008 System which hasn’t been patched with KB958644 and without antivirus installed. 1. Please double check whether your client is installed with the patch as shown below (remember to tick Show updates). From control panel, then go to add or remove program icon. 2. Ensure your antivirus is updated with the latest definition file. 3. Please also ensure all your external hard drive and thumb drive are clean from virus/malware.